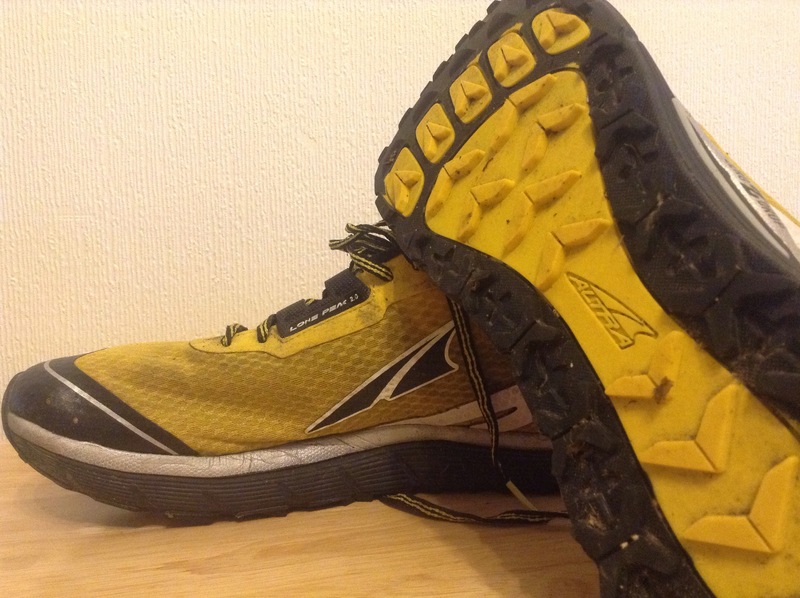 #Review – Altra Lone Peak 2.0 are these the best shoes I’ve ever run in? I’ve been through a fair few pairs of shoes and even more miles. There are probably only half a dozen pairs of running shoes that I haven’t gotten on with – most of them Salomon. On my own personal journey to foot comfort nirvana I’ve passed through Merrell, Vibram FiveFingers, Brooks, Pearl Izumi, Inov8, Adidas, Hoka, Asics and even a couple of pairs of Skora. I’ve worn them all and more in an effort to find the shoe that would serve me best. My interest in Altra has been relatively long standing, @borleyrose has been banging on about them since we first started chatting via Twitter but the combination of Hoka and Inov8 were serving me very well and I saw no reason to move away from a decent rotation of trail shoes. However, her enthusiasm for them did ensure that if I ever saw them in a shop and was in the market for new kicks then I’d try them on. Then it happened, I was at the London Marathon Expo and I had visited the Hoka stand and they weren’t very helpful at all. When I asked if they had anything in a 9.5 that was a wider fit and suitable for the trail the man who a talking to me brought me out a pair of their new ‘Speedgoat’. Not only was he simply wanting to show off his new model but the speedboat is designed for the exceptionally narrow footed runner – he hadn’t listened and I was finally pissed off with Hoka. Luckily as I stepped away from the stand and looked left there in big bold letters were Altra. Olympus, Lone Peak, Superior – they had them all. ‘Excuse me, do you have the Lone Peak in a 9.5’ I asked. The gentleman couldn’t have been nicer and he had me try the 9.5 but when he said I should consider the 10 I felt a little foolish. ‘Take them for a spin’ he urged – I did. I bounded round the exhibition hall of Excel like nobody’s business with the Lone Peak feeling light and fresh on my feet. Bouncy, bouncy, bouncy went my feet as they pounded and spun around the various stands. I slowed, looked down at my feet and then bounded headlong back to the Altra stand. I told the chaps running the stand that they were possibly the most comfortable show I has ever tried, and I really wasn’t lying but at £110 they’re expensive and I’ve been trying to cut back on the amount of shoes I’m using at any one time. ‘I need to think about these, by the way do they come in any colors?’ I asked simply as I wasn’t keen on the rather muted black option. The reply was that ‘they come in yellow too’. But they didn’t have those in stock. 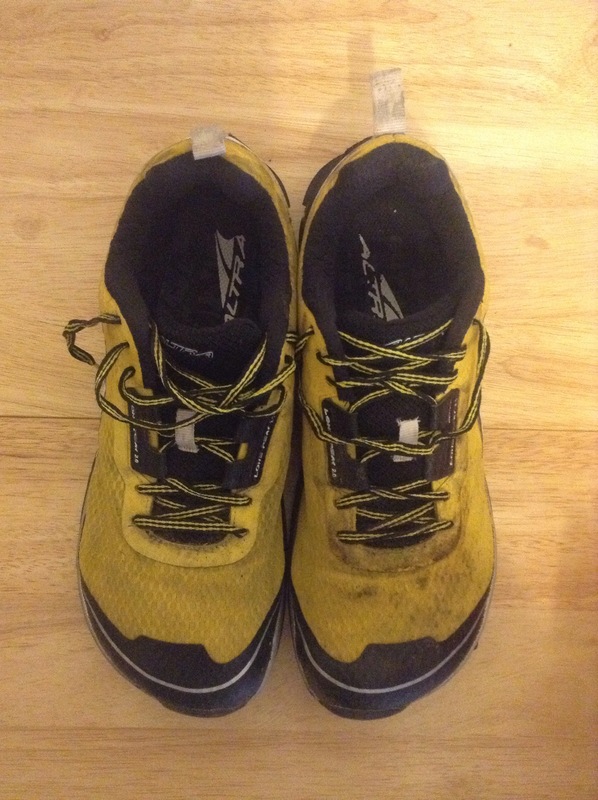 What was in my mind now was a shoe for the Thames Path 100, but that race was now only a week away from my trying the Altra on. I immediately left the exhibition centre, jumped on a train and opened up every bit of research I could find on the LP2.0 and viewed the excellent Ginger Runners glowing blog post about them – view it here. I then started looking for the yellow version of the shoe. 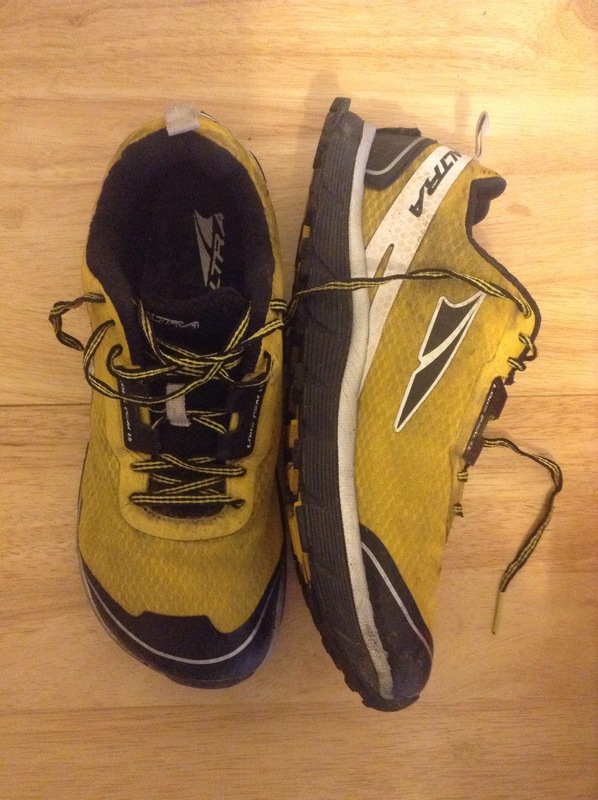 By the following morning I had (thanks to Twitter) sourced what I expected was the last pair of Altra Lone Peak 2.0 size 10 UK in yellow and the Ultra Runner Store (www.ultra-runner.com). They guys there were amazing and managed to get me the shoes by the Monday after the London Marathon – excellent service and I look forward to using them again. But that’s how I came to the shoe, what about the shoe? Now for reviewing purposes I normally wear a pair for about fifteen runs and the total distance for that can be anywhere between say 100km and 200km but the Lone Peak have only done 3 runs but one of them was the awesome Thames Path 100 therefore I’ve put in around 180km on these and in the interest of avoiding bias I paid for them with my own money. The Lone Peak 2.0™ was inspired by one of the most rocky, rugged mountains in the Wasatch Range and was designed to tackle the gnarly terrain of the Wasatch 100. The FootShape™ toe box allows your toes to relax and spread out naturally for more comfort and stability in uphill and downhill trail conditions. Sandwiched StoneGuard™ technology offers protection from rocks and other trail debris while the carbon rubber TrailClaw™ outsole combines unique uphill and downhill lug traction for every trail condition. Quick-dry, abrasion-resistant mesh on the upper allows you to plow through puddles, debris or whatever nature throws at you. Altra are perfectly designed for that slightly wider footed runner and the design of being more foot shaped does indeed allow your foot room to breathe, room to land on impact, promote better form and give rider stability. I found that out of the box I instinctively knew that the Altra were going to be move with me and not against me. Upper: the upper claims to be a quick drying mesh and I was lucky enough to give them a thorough testing in both long wet grass and the rain of the TP100. The first thing you notice is that the upper stays dry and when it does finally get wet then it offers up a reasonably swift drying. However, if you put your foot through a river then the Lone Peak isn’t the quickest to drain and compared to say the Race Ultra 270 or even the Challenger ATR you’ll feel like you’re carrying the river away with you – at least for a few minutes. However, that’s a very minor negative and actually the upper feels light and not once did my feet feel like they were confined in a big fabric prison. Durability and quality: this seems to be a bit of a bone of contention with some people suggesting that the LP2.0 start to disintegrate within 250km – well I’ll have hit 250km within half a dozen runs and to be honest they look pretty damn fine to me, the lugs look in good condition with almost no wear, the upper appears in one piece and strong and there is a whole feel to these shoes that Altra have listened to runners concerns. Cushioning: As a lover of most of Inov8’s range of footwear I know what it’s like to have your feet feel the ground below you. The Trailroc, the Roclite, the Race Ultra 290 and the truly awesome Race Ultra 270 know it’s important to have some contact with the ground, to know that you’re doing the right thing with the terrain. The Lone Peak are different, they claim to be of moderate cushioning, zero drop but with a 26mm stack height and a rock plate + lateral stone guard. What does this mean for you? Basically it means that you can feel the ground, you can connect with terrain but not so much that you’re going to take a battering in your feet over the distance. Over the TP100 I got to more than 70 miles before problems kicked in and that was less to do with the shoe and more to do with my own stupidity. It’s a weird sensation feeling the impact but not being affected by it, when you run in Hoka you don’t really feel the ground below you and when you run in Inov8 you feel pretty well connected to the ground – this is balance between the two. I’ve seen reviews describe the LP2.0 as a ‘limousine for your feet’ and this to me seems like a very good description. The Lugs offer forward, back grooves intended for up and down the hills which are dense and deep enough for anything but thick claggy mud. The Lone Peak 2.0 aren’t the natural friend of mud or the UK ultra scene because we are always guaranteed mud somewhere on the route. 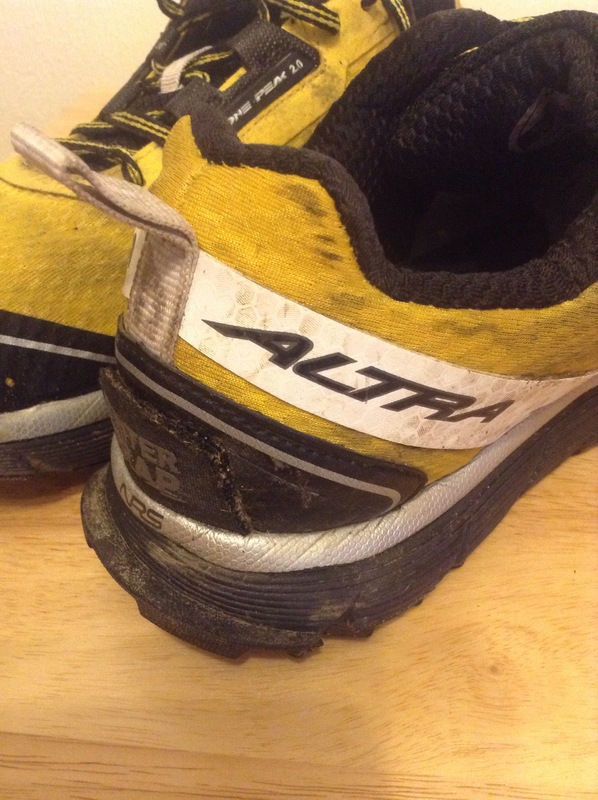 These Altra were clearly built for dry, hard packed trail but the outsole on the LP2.0 goes some way to addressing the concerns of the European ultra marathoner that they are looking at the best ways to find a shoe to fit our conditions. Equally to note though with these are that the lugs are shallow enough to make going road to trail a possibility but deep enough that thy can force their way through the mud. I did find that the outsole didn’t kick clear of mud very easily but this just required me to thrust my leg forward every few kilometres and flick it clean. There’s something also about the beauty of the outsole, having already established that the outsole appears to be durable I’d like to give mention to the fact that the outsole is also tremendously beautiful, the foot shape as you lift your legs up gets shown to everyone behind you and that’s ankle talking point – you can also spot other Altra users a mile off. The big patches of yellow on my LP2.0 made for some exciting looking photographs (thanks Stuart March Photography for making them look awesome in my TP100 pictures). When I first put them on they looked more like clown shoes than any of my Hoka, they are wide, they are long and there does appear to be a huge amount of fabric encasing your foot. In the black and red I’m a little bit ‘meh’ about them – too safe but in the yellow they just look awesome and once they are on you don’t notice the clown shoe nature of them. These are a good looking pair of shoes and infact it was partly me admiring my new Altra in shop windows as I ran through Soho recently that was the cause of my newly broken finger (long story). The Ginger Runner and I disagree on this one, he says that the LP2.0 is too heavy, has too much fabric on the heel – could be lighter. I say that the nominal amount of additional weight gives you nothing but pleasure, my heel felt comforted over the 100 mile distance and my feet barely noticed that I had shoes on – I’ll admit they don’t feel like you’re wearing a pair of FiveFingers but then nothing does. The LP2.0 feel soft and light on your feet and I never felt fatigued in them. That said all of the latest generation of cushioned running footwear is so much lighter than it used to be and this is very much down to the manufacturers taking care with right balance of the right materials. Half size up I’d suggest, however, I’d really suggesting going to a shop and trying them. I paid, with postage, £103.50, which is a nominal saving on their RRP. What you can clearly say is that Altra (the whole range) is a but pricey but saying that it’s inline with its chief competitors like the Cascadia, the Mafate Speed, Challenger ATR and the various options from Inov8 and the like. I’ll be honest I don’t want to pay over £100 for every pair of running shoes I own but these were an investment in my feet and my running. I’d advise waiting until they come into a sale to buy Altra – but I fear you’d be waiting a long time. The gaiter trap is awesome with a small piece of protected Velcro to tie in your dirty girl gaiters is very much appreciated and actually made my gaiters much more effective in keeping crap away from my foot. The tail rudder I’m not so sure about but it served no harmful purpose and perhaps I’ll find a use for it when I hit some slightly more serious hills. The lateral stone guard and the rock plate give nice solid protection and yet are thin enough to still let you feel the ground – ultimately these are a finely crafted shoe. £100? Are they value for money? Yes I believe so. Altra have a product with enough differentiation to make them standalone in a very crowded marketplace. 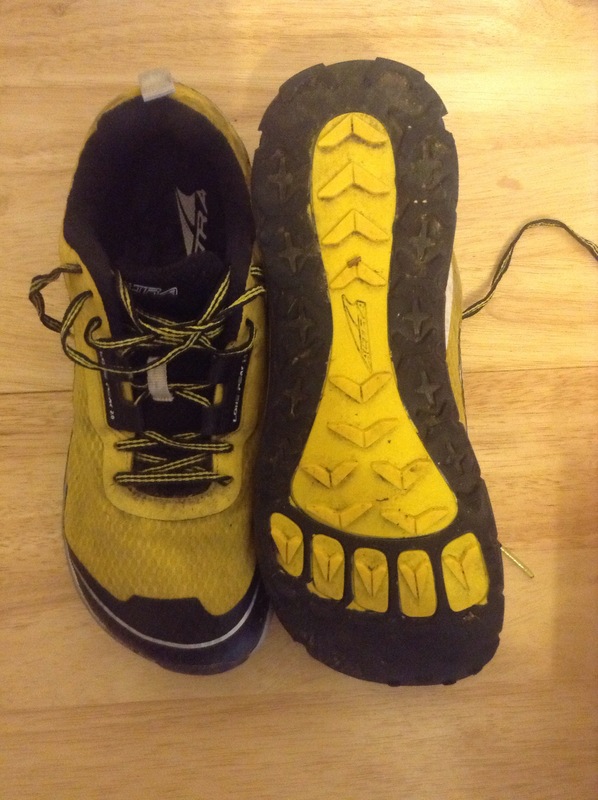 They aren’t an alternative to Hoka or Inov8, they are a uniquely crafted piece of footwear that deserve to be considered as such. For some fitting may well be a problem as they are very wide fitting shoes but this is going to be a personal preference thing, this though leads me to the main problem with Altra and that is getting hold of them to try. It took me nearly 3 months to find a pair I could try on without visiting an online store and then it was the actual Altra representatives at the London Marathon. Come on Altra improve your supplier/retailer network. Really good shoe with the caveat that they aren’t for everyone and if you can ‘try before you buy’. I’m an Altra convert and they have won a little place in my heart and will replace Hoka in my shoe rotation, and actually these bad boys might even make the grade for the CCC in August and replace the Inov8s I had earmarks for that race. Good work Altra, looking forward to trying your other shoes.